Observers are utterly confused about the difference between natural size and overall body mass. Too readily was it believed that Kell Brook (36-1, 25 KO), who muscle-bulked his way up to the middleweight division from welterweight on who knows what supplements, was fit to be fighting at middleweight because he was walking around heavier than Gennady Golovkin (36-0, 33 KO). The fact is that Kell Brook is an endo-mesomorph body-typically. That is to say, he is naturally muscled with a propensity to gain weight and carry extra body fat and water. Whereas Golovkin, on the other hand, is a pure ectomorph with unusually high bone density in his hands and forearms, translating to extremely heavy-handed blunt punching power – emphasis on punching power, as there are an infinite number of measures of power that are task specific; e.g., throwing a baseball, punting a football, running a 40-yard dash. One specific attribute that often binds those who excel at these myriad of events is that the performers are often long limbed. A longer arm, for example, results in greater instantaneous tangential speed at the point of release of throwing a baseball, at the point of impact when kicking a football, at the point of impact...when landing a punch. Furthermore, punching power is a function of two variables: the instantaneous speed of the object and its density, not its overall mass. Why does the density, and not overall mass, matter more? Because the force of the impact is measured in pounds per square inch, i.e., the maximum amount of mass that can be squeezed into an infinitesimally small area. Let us rework this again. Regardless of a boxer’s body type, it is his knuckles, i.e. his skeletal frame, that is impacting is opponent during a punch. The utility of muscle mass is its ability to generate force to accelerate the skeleton so that it can impact an object at high speed. So yea, Kell Brook carried his extra muscle mass on a smaller skeletal frame than Golovkin without having exceptional speed to make up the difference. Therefore, despite the physique of Kell Brook, and despite Golovkin slender appearance, it was Golovkin, not Brook, who was the more powerful man in the ring! So yea, Brook may be able to out-lift Golovkin in the gym, but this is boxing not a weightlifting contest. ...And was it already mentioned that bone is more dense than muscle? Bone also carries less water than muscle. Because a larger percentage of Golovkin’s body mass is in his bones – as opposed to body fat or muscle tissue – his walk-around weight is closer to his fighting weight. Brook walks around heavier because he has a different body type, not because he is the larger man. What did Gennady Golovkin say about the massively muscular Kell Brook even after the fight? That he was too small, that he did not feel Brook’s power! Round 1: With slightly under 1:40 left, Golovkin hurt Brook with a left hook to the ribcage while Brook was against the ropes. Brook held on to give himself a chance to recover. Brook spent most of the round against the ropes, not using his jab, not throwing punches. Most critically, Brook was hit with a left hook that caused some swelling around his right eye that bothered him every round thereafter. Round 2: Brook was very active, let his hands go in the center of the ring, while Golovkin displayed no defense. As much as Golovkin’s defense warrants criticism – his slow reflexes and lack of head movement – this was primarily due to Brook being undersized and not being able to hurt Golovkin. By this time, it was established that Golovkin’s favorite punch was his lead left hook which he often followed with overhand rights; he missed Brook by inches repeatedly. Brook clearly won this round. Round 3: Golovkin came out like he had something to prove and swung for the fences with his wide hooks; he looked sloppy but Brook was more interested in protecting himself than countering. Brook had a flurry where he landed punches in close, but that clearly was not natural for Brook, fighting inside that is. This round was competitive due to Golovkin’s lack of activity in spots. Round 4: This was another competitive round that saw Brook landing pull-counters with his right hand. He still spent much of his time against the ropes. Round 5: Golovkin jumped all over Brook against the ropes landing thudding right hands in the first thirty seconds. Golovkin’s punches were heavy but not clean. 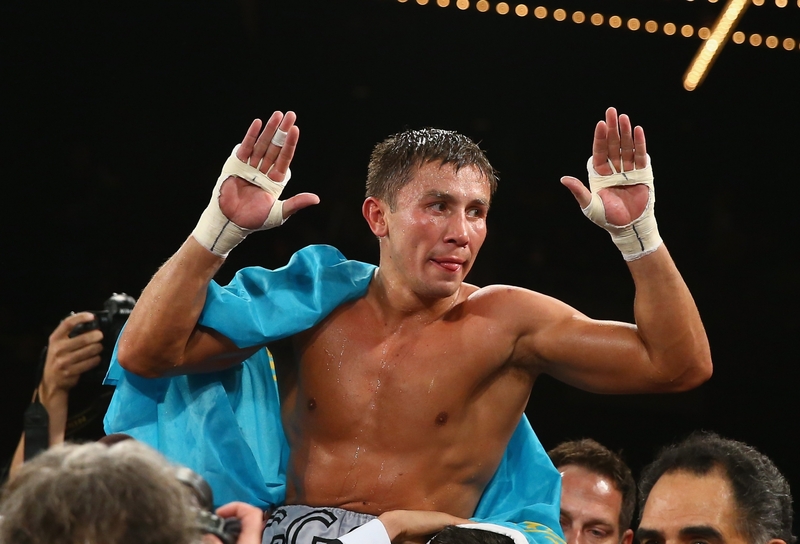 Brook waved his hands in the air to suggest to Golovkin that he could handle his power. A jab landed that bopped Brook’s head back. Golovkin then landed more right hands as Brook threw nothing in return. Brook’s corner rightfully threw in the towel to prevent him from becoming damaged goods. Brook never displayed great mobility and the added body mass did not help. But that was not Brook’s problem, as he has never been extraordinarily mobile. He should have used his muscle mass and shorter stature to fight Golovkin in close and back him up. Golovkin denied the rumor that he was sick, which trended after many felt he looked less than spectacular at the weigh-in. In all, Brook was massive yet undersized nonetheless and he looked as much.